Today, pagan black metal band Askrinn, the solo project of Valenten from France, is proud to share with you its first full-length album, available as both a 60-copies limited CD edition and as a free download in their official page. This new opus, named “Hjørleifsljóð“, is based on four chapters of an Icelandic saga written in the 14th century, called “The Saga of Half” or “Hálfssaga“, although the story happens a few hundred years before. The lyrics are therefore in Old Norse, the language that used to be spoken by the Viking tribes back in the Middle-Ages. They depict the Scandinavian lore of that time, along with a non-negligible dose of esoteric and mythological references as the original text does contain a lot of fantastical elements. 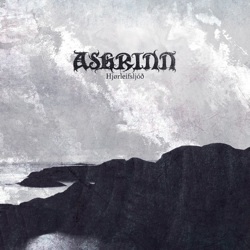 Musically, Askrinn draws inspiration from bands like Arckanum or Bathory, and combines old school-influenced black metal with evocative and earthly melodies in order to create powerful black metal riffs. Thanks a lot for sharing the news !